Welcome to the first foray into our annual look at the candidates who will be competing to replace Ohio State’s departed starters. Today we start where everything starts in sports — at quarterback. 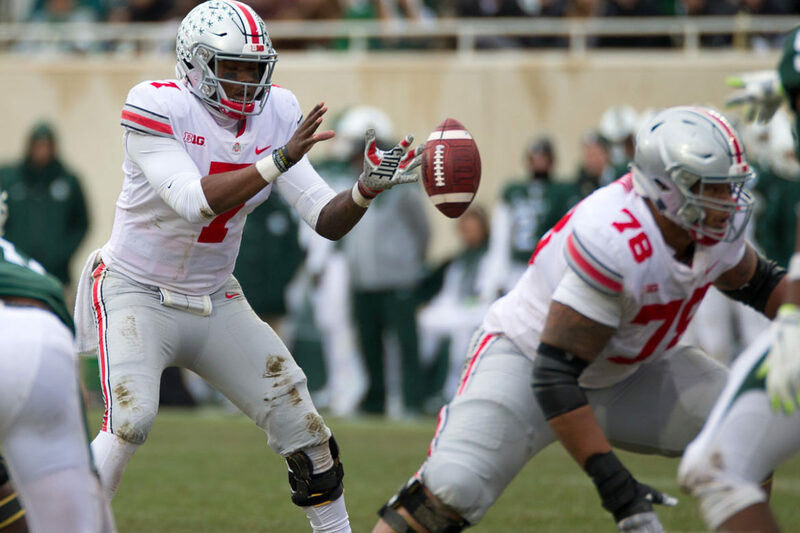 Replacing Dwayne Haskins won’t be difficult because it’s going to happen regardless, but living up to the standard that he set last season is where the difficulty comes in. Haskins led the nation with 4,831 yards passing and 50 touchdown last season, and was fourth in the nation in completion percentage (70.0%). If you put that kind of expectation on the next guy to come along, you may as well also put an expectation for flight and psychic ability on him as well, because the latter two are almost as likely to happen. It wasn’t just the numbers that Haskins put up that will be difficult to replace. The numbers were merely a byproduct of Haskins’ ability to put the football precisely where it needed to be. Tight windows were wide open for Haskins, and he put the ball in a position for receivers to do something with it after the catch. That kind of precision is going to be demanded of the next starting quarterback, but there is no telling how close to the mark they’ll be in 2019. With last month’s transfer of Tate Martell to Miami and the decommitment of Dwan Mathis in the days leading up to the early signing period, Ohio State will enter spring with two candidates to win the starting job and replace Dwayne Haskins. The person who caused the move of both Martell and Mathis is Justin Fields, who transferred to OSU from Georgia last month. Fields was the No. 2 overall prospect in the 2018 class and the No. 1 dual-threat quarterback in the nation. He played in most games last season for the Bulldogs, throwing for 328 yards and rushing for 266 yards, accounting for eight touchdowns along the way. Potentially, Fields is some kind of combination of OSU’s last four starting quarterbacks — Braxton Miller, JT Barrett, Cardale Jones, and Dwayne Haskins. He is athletic, has a huge arm, and is a uniquely talented thrower. What he is lacking, however, is the experience in Ryan Day’s offense that the other candidate — Matthew Baldwin — possesses. Before he left, Martell was adamant that no quarterback could come into Day’s offense and learn it in one offseason well enough to win the starting job. Baldwin agreed that it is a very difficult offense to learn, but having now been in it for an entire year, he feels comfortable leading the (no)huddle. If you are looking for a comparison for Baldwin, think JT Barrett but with a better arm. Buckeye receivers have mentioned Baldwin’s arm strength since he arrived last winter, and they believe the quarterback competition this spring is going to be anybody’s game. The other quarterback in the mix will be fifth-year senior Chris Chugunov, who was a graduate transfer last season for the Buckeyes. Chugunov started a few games at West Virginia in his career, but he is viewed as an emergency quarterback. Ohio State will likely add a graduate transfer at some point, but it may or may not happen before spring football. Former walk-on Kory Curtis has transferred out, so the depth here is pretty thin. Since there is a competition, Justin Fields and Matthew Baldwin will likely split the reps pretty evenly. Think 45/45 with Chris Chugunov maybe getting 10%. What Ryan Day and quarterbacks coach Mike Yurcich will be looking for is a deep understanding of the offense and the best mover of the football. That should be Matthew Baldwin early on because of his familiarity with the offense, but will he be able to maintain that lead? Nothing will be settled this spring as it will be an opportunity simply to get both quarterbacks accustomed to the offense, but most people on the outside expect Justin Fields to eventually win the job because they have seen him on the field before and haven’t seen Matthew Baldwin. Fields transferred out of Georgia because he felt he wasn’t going to get a shot to start. He will get that shot at Ohio State, but not so much this spring that Baldwin already believes he is the odd man out. Expect this battle to be fought well into fall camp, and possibly even into September.